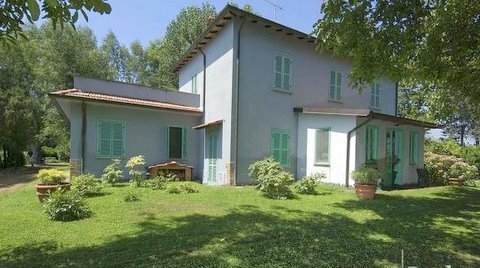 Surrounded by green countryside, this beautiful exclusive villa with swimming pool is located in the fertile region of Pianura Pontina, in the vicinity of Latina. 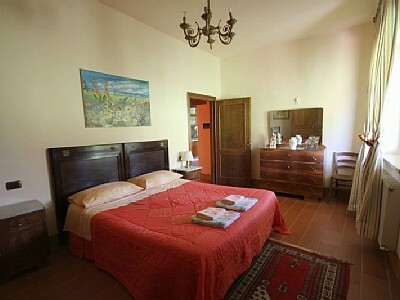 The proximity to Rome (70 kilometres), easily reachable by train (30 minutes from Roma Termini railway station) or by car (1 hour from the city centre), makes it an ideal starting point for exploring the charm of one of the most beautiful cities in the world without forgoing the relaxing atmosphere of the Roman countryside. The area boasts also many interesting towns such as Gaeta, Sperlonga, Sabaudia and Sermoneta, with Naples 175 km away. The villa is situated on a 10-hectare property with a park-style garden, planted with flourishing gardenias, mimosas, eucalyptus trees and other fragrant plants. The garden features a separate sauna area and a swimming pool, easily reached on foot. Through the broad glass veranda of the living room, guests can enter the garden with its fountain, terrace and barbecue, plus various other seating areas, partly covered. 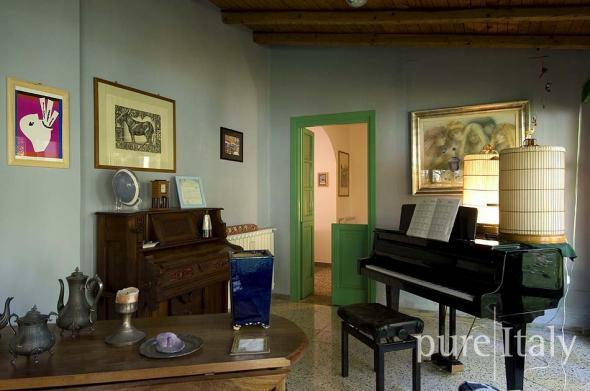 The house itself features an eclectic mix of stylish, original and tasteful colours and furnishings. 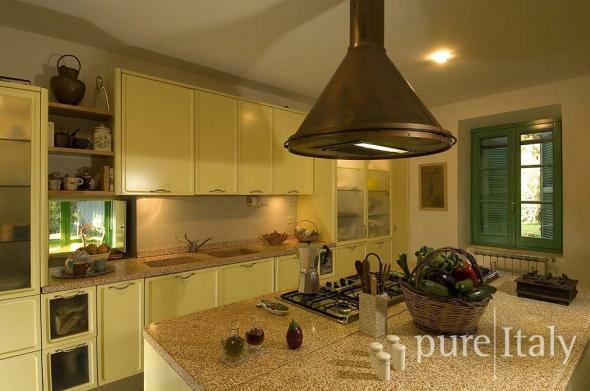 The atmosphere is almost that of an artist’s home: numerous paintings, portraits and still lives on the walls; an open fireplace; choice comfy furniture with the odd antique piece; ceiling beams; and a pastel yellow kitchen for trying one’s hand at the art of cooking. 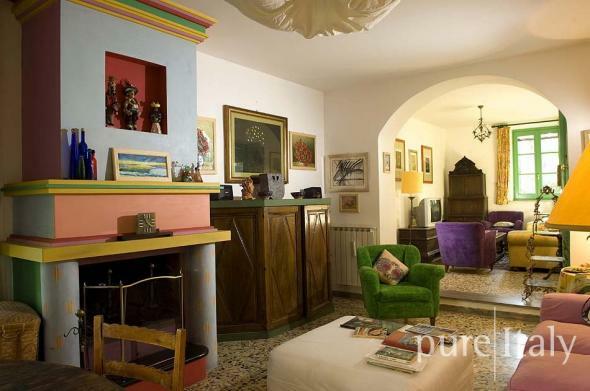 Square metres: 240, G.F.: entrance, large living-room with fireplace, living/dining room, kitchen, 1 double bedroom, 1 twin bedroom, 1 bathroom with shower and whirpool bath, 1 bathroom with shower, terraces, solarium, swimming pool, garden. 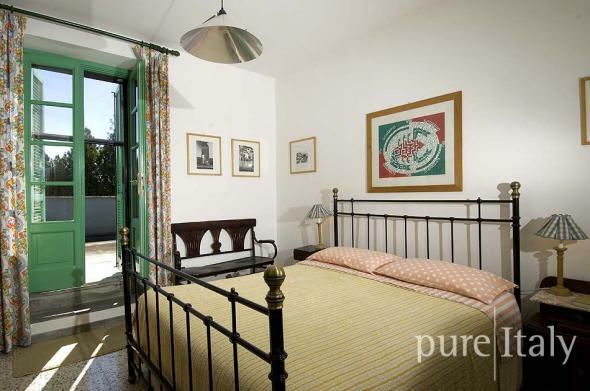 1st F.: 1 double bedroom, 1 twin bedroom, 1 bedroom with 120cm bed (French bed), anteroom with walk-in closet, 1 bathroom with shower, terrace (sq.m. 50). On the outside: sauna and 1 bathroom with shower.